I once had a handheld tetris game, which had many variants of tetris inside, with many different pieces. So, I have created this little script. It is completely non graphic (i.e. there are no bitmaps) - all is done by color GUI elements. The nice thing about it (to me anyways) is that you can quite easily create additional games, by creating a new game template file. In this template, you can define some variables of the game + define the piece shapes. I have added some minimal sounds for completeness. Also, some options (colors etc) are configurable in the INI. Download this ZIP archive for source + readme + sounds + some game variations. 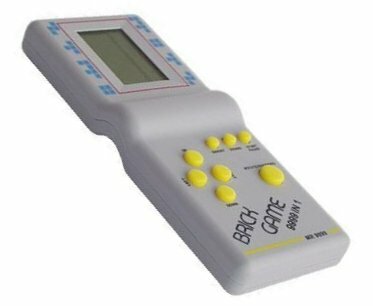 I am not sure it is the same one, back then there were many tetris games - it was popular. Mine looked something like this, in black. The writings are familiar, so I may had the exact model. If you still have it - maybe you can tell me if I missed any piece shape (or added one that did not exist). Check the Deluxe Tetris template - this was supposed to be a replica of that game, as I remember it. Thats a very nice mod. I was wondering if I would see some game templates here, but I did not expect that the first one would exploit the rotation states so nicely as you did. Did you intentionally make the speeds like this? Starts with 200ms sleep, then from the second piece on, it will use 900ms constantly. Icarus, that is very professionally done! :! : I happily relinquish the title of "Best self-contained AHK game produced to date." You've earned it. I love the option to make my own pieces (and so easily too). One suggestion (from playing a lot of Tetris over the years) - it can be handy to have the drop button (down arrow) execute a "push" when it's just tapped. Meaning it only drops the piece one row per press and doesn't drop the piece all the way to the bottom until it's been held for a second or two. This prevents an accidental down press from ruining a game, and is useful for sliding one piece under the edge of another in slower levels. Icarus, that is very professionally done! I am glad you find it amusing. One suggestion (from playing a lot of Tetris over the years) - it can be handy to have the drop button (down arrow) execute a "push" when it's just tapped. Meaning it only drops the piece one row per press and doesn't drop the piece all the way to the bottom until it's been held for a second or two. You mean you prefer a soft drop instead of the implemented hard drop. I hear you. Will post the updated package up in the first post in a few minutes. Version 0.13 is up:[*:efvco7ho]Added : Some games (thanks Z_Gecko for ChaoTris). [*:efvco7ho]Added : If last played game is no longer found (file deleted/renamed), we will load the first found game. [*:efvco7ho]Changed: The start button will now have a fixed size. 1.) While playing, the dropdownlist changes every time the selection. It doesn't jam the game, but it's a litle bit annoying. Hold on, taking a look. Found the bug caused by ChaoTris. Fixed, will be uploaded soon. I was unable to reproduce your drop down list issue. You are saying it changes while you are playing? The code seem to handle it. Yeah, it changes while acting with the arrow keys. For me, it looks like Focus stays on the ddl control. Im using Windows XP Sp3. Thats weird... Since all the arrow keys are mapped to do something else, they are not supposed to effect the GUI. I am assuming that if you change the focus (press TAB to move the focus to the Start button) this does not happen. Right? In any case, in the new version I am moving the focus away from the DDL on startup. Uploading in a few mins.